I am writing to you today to ask for your essential support in calling for the release of two French journalists, jailed only for reporting on what is really happening to my people and I am also asking you to help us together break down the walls of silence in occupied West Papua. Thomas Dandois and Valentine Bourrat are two journalists who had been in West Papua making a documentary about the real situation in West Papua. The pair were arrested on 6th August, jailed by the Indonesian police and are now being threatened with a 5 year jail sentence and $40,000 US dollar fine for simply being journalists in West Papua. I am calling on all friends and supporters to please join us for an international day of action on Monday 25th August calling for their release. The Free West Papua Campaign will be holding a protest outside the Indonesian Embassy at 38, Grosvenor Square in London from 12:00 onward and I urge everyone around the world available to please also hold demonstrations in your local area on the same day for the release of Thomas and Valentine and for genuine media freedom in West Papua. For the last 50 years, the Indonesian government has banned all foreign journalists from entering West Papua in an attempt to cover up the atrocities being committed. We desperately need urgent support in helping to put pressure on the Indonesian government to release Thomas and Valentine and to finally allow genuine media freedom and journalist access in West Papua. 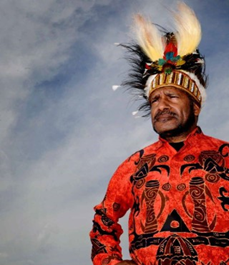 Last year, the Indonesian foreign mister Marty Natalegawa claimed that now the Indonesian government allows international media to visit West Papua and the local Governor, Lukas Enembe also said he welcomed journalists to visit West Papua. If international journalists are now welcome to visit, why were Thomas Dandois and Valentine Bourrat arrested and threatened with a 5 year jail sentence just for being there? Friends, please join me and my people on this international day of action to call for their release, and for journalist access at last in occupied West Papua. Thank you very much for all your ongoing help and support. Join the international call for media freedom in West Papua. 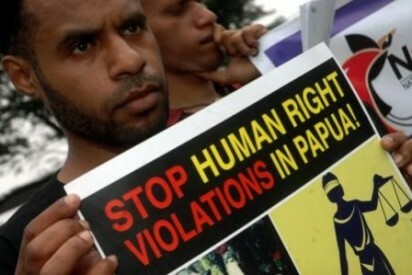 Please request your government to pressure Indonesia to allow access to West Papua for international journalists.